First impressions count. A businessman who doesn’t maintain a professional appearance presents the image of not being able to perform adequately on the job. Anyone who aspires to top management knows that personal appearance is paramount. 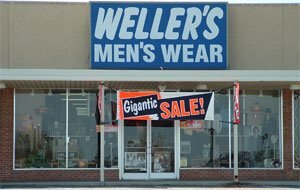 Weller’s can take the guesswork out of dressing for success. From suits to Levi jeans, tuxedos for a wedding or prom and shoes Weller’s is home owned and here to serve you.